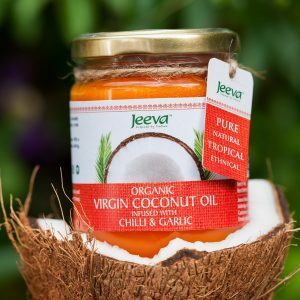 Jeeva combines ancient Ayurvedic traditions with modern ethical values, creating healthy products from the finest sustainable ingredients. We source premium, hand-­‐picked coconuts from small farms in Sri Lanka and deliver them straight from nature to jar. 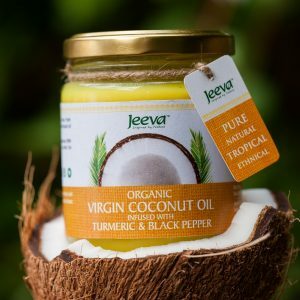 Our raw Organic Virgin Coconut Oil (available natural or with added chilli & garlic, turmeric & black pepper or vanilla for extra flavour) and Organic King Coconut Oil are extracted with minimal human intervention because this retains the maximum nutritional value of our premium ingredients. 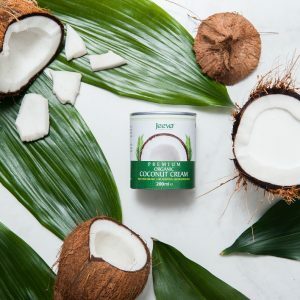 We also produce a deliciously rich and full-­flavoured Premium Organic Coconut Cream and a gluten-­‐free Premium Organic Coconut Flour suitable for special diets, such as paleo and low GI. 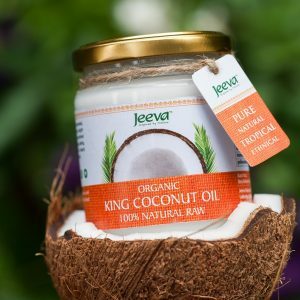 Jeeva means ‘full of life’ and our products burst with natural goodness. Coconut oil is not just an incredibly versatile cooking ingredient, but also well known for its beauty benefits and practical uses. With a long shelf life and high burning point, coconut oil is the secret weapon in your kitchen cupboard. It can be used for frying, roasting, baking and spreading, as well as in smoothies and salad dressings. 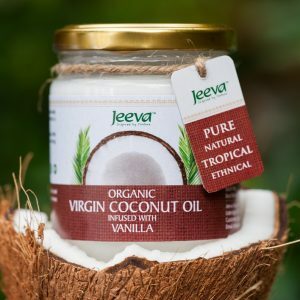 As it’s naturally gluten-­‐free, vegan and raw, virgin coconut oil is a particularly good dairy-­‐replacement for the lactose-­‐intolerant and people on special diets. For generations, Sri Lankan people have been using organic coconut oil to keep their skin soft and smooth. It’s a powerful moisturiser that can be used all over the body, including the face, lips, hands and hair. Use it instead of creams and lotions or as make-­‐up remover (it even lifts eyeliner effortlessly), lip balm, deep conditioner, shaving oil, massage oil and bath oil. 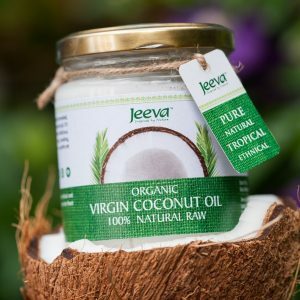 Known as the ‘healthiest oil on earth’, organic raw coconut oil is a versatile offering straight from Mother Nature. Coconut oil comprises of medium chain fatty acid and is therefore easy to digest. It is also widely used for teeth-­‐whitening, as digestion and constipation relief, to help treat eczema, and as a natural wood polish. Once you’ve tasted our Premium Organic Coconut Cream, you’ll never want to cook with coconut milk from the supermarket again. Thick, creamy and packed full of flavour, this is the stuff you need to take your homemade curries to the next level. It’s also great in smoothies and tropical cocktails. 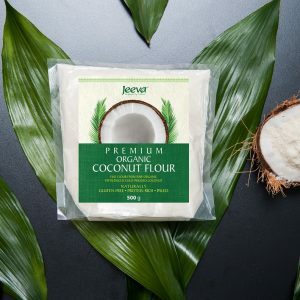 High in fibre and protein while free from gluten and grains, our Premium Organic Coconut Flour is a great flour substitute when you’re cooking for anyone with a wheat intolerance or nut allergy. It’s also suitable for people on paleo and low GI diets. You can use it for sweet as well as savoury baking and to boost the fibre content of your favourite smoothies and shakes.